Hari, a teenager believes that he is the reincarnation of Maharaja Ranjit Singh, who is also known as the Lion of Punjab. Suzzane, Hari’s girlfriend tries to find out more about his past life using the practice of regression and discovers that he has had more than one past lives. 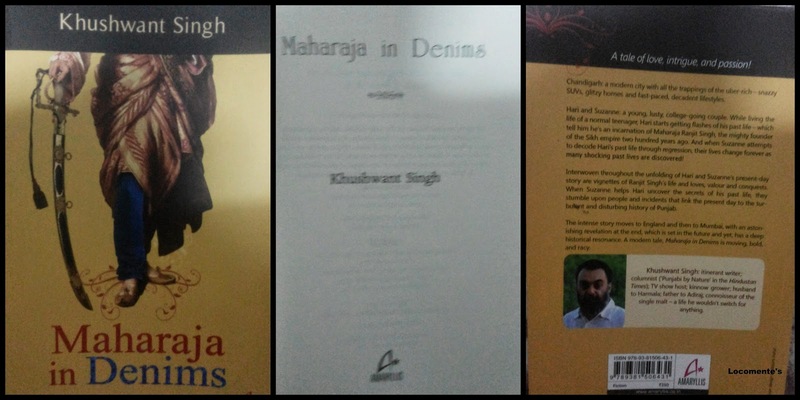 The book Maharaja in Denims gives the readers an understanding of Punjab’s history and the after-effects of Indira Gandhi’s assassination. Furthermore, the book talks about Ranjit Singh’s life, love and conquests. The plot is gripping and makes you not want to put the book down. Khushwant Singh was an Indian author, columnist and TV show host. Hari is a lusty and carefree. He is handsome and also smart. Suzanne is beautiful and ambitious. She is helpful and understanding. Shamsher, Hari’s father, is progressive and very friendly. The cover page is perfect. I really fell in love with it. The title is equally interesting and unique. And, the book blurb is brief and intriguing. The story begins with a bang, straight to the plot. The narrative is simple and lucid. I liked the way in which the author has integrated history to the present. The idea of reincarnation is well-established in a very convincing manner. The past life regression sessions brings Goosebumps. I also liked the climax. It is unexpected. The story amazes us. It makes us wonder about the capacity of human mind. This plot re-emphasizes the well-known fact, mind is complex. The characterization of Shamsher, Hari’s father, is very nice. He is not presented in a clichéd manner, Instead he is very progressive and respects the space of his teenage son. As I always say, I really appreciate authors who take that extra pain to present a well-researched plot. Representing history from a legend’s point of view is not easy. And, the author has done that job in a commendable manner. The book carries too much of lust and history. The overdose, at times, becomes unbearable. Although the twist in the end is interesting, it also makes us wonder about Hari and his character. Yes it is interesting because of the historical info it carries.. The title sure is catchy, but I have not heard many good things about this one. And it carries lots of history with it! Nice review :) How many books do you read per year? Great!! Over last ten years, my average books I read per year would have been 10 to 12. And this year I have read 30 already! So many books; so little time!!! But, the narrative could have been better!